Safety is something that should not be taken lightly, both at work and at home. As a new, full-time employee I recently received OSHA training which included multiple videos, quizzes and information sessions. This same training is generally repeated yearly for current employees. Some of the information may seem like general knowledge, but it is important for companies to abide by government regulations and make sure that all employees have the same knowledge base of what to do in emergency situations, as well as every day occurrences. The everyday occurrences part is sometimes over looked by companies and definitely stood out to me during training. I didn’t know that OSHA training also involved information on how to keep yourself safe on an everyday basis, but a good refresher on safety tips within your home is always appreciated. It has been said that most injuries aren’t really accidents, but rather things that happen because people don’t think before they do unsafe acts. Customers will notice that the new edition includes more than 40 additional pages of new and innovative products for the food and dairy industries including PolyCo VR™ aprons, the VersaClenz hand hygiene system, a new line of dust and wet mops, the Speed Pro bath and a new line of Woodland herbs & spices. The easy-to-use “How to Order” boxes, terminology, and other guides were expanded to help provide customers with a one-stop source to find the right product for their applications. The newly designed color-coded insert also includes four additional pages of products to expand Nelson-Jameson’s already extensive color-coded offering. In an effort to give customers even more options, Nelson-Jameson now has many more color-coded products available in orange. The catalog offers many hard-to-find and specialty products exclusive to Nelson-Jameson, as well as hundreds of supply items used daily. 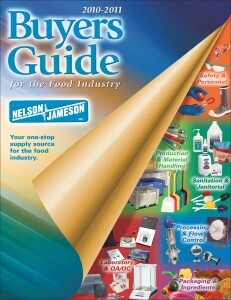 Food processing plants can request a FREE copy of the Nelson-Jameson Buyers Guide by calling 800/826-8302. Or log on to their web site at www.nelsonjameson.com. Application or most common product to be tested: All pH electrodes can be used for aqueous solutions. Certain profiles are more suited for semi-solids, cheeses, meats, etc. Temperature of product: Temperature impacts accuracy. If product is room temperature there is generally no need for an automatic temperature compensator (ATC). For hot and/or cold product an ATC is recommended. ATC’s are either a stand alone sensor or a pH electrode with ATC built-in. Meter manufacturers have different inputs for ATC; manufacturer and model number of meters are required. Acceptability of glass body electrodes: There are some areas of restriction, generally production areas, where glass-body electrodes would not be advised. No matter what your application, Nelson-Jameson can help determine the right electrode for the job. Feel free to call our tech service department (800-826-8302) for further details. What do you think is the number one cause of global food recalls? Answer: food allergens. We are hearing more and more about the various food allergies that increasing numbers of people must live with. When I think back to when I was young the only allergy I ever remember is if someone was allergic to bees. I honestly don’t remember ever knowing or hearing of anyone allergic to a particular food. I would venture a guess that each and every one of you knows someone that has a food allergy of some sort. My son for instance is allergic to mushrooms, who ever heard of that one? It is estimated that between 150 to 200 Americans die each year due to some sort of allergic reaction to food. What exactly causes a person to “develop” a food allergy? It is a specific type of adverse food reaction involving the immune system. The body produces an allergic antibody to a food. Once a specific food is eaten and binds with the antibody, an allergic reaction occurs. To reduce the risks, the FDA is working to ensure that the eight major allergenic ingredients in food are accurately labeled. Since 2006, food labels must clearly state whether the food contains an ingredient that is considered a major food allergen. 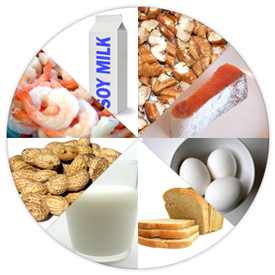 These eight major food allergens are also known in the food industry as The “BIG 8”; milk, eggs, peanuts, tree nuts such as almonds, walnuts and pecans, soybeans, wheat, fish and shellfish such as crab, shrimp and lobster.